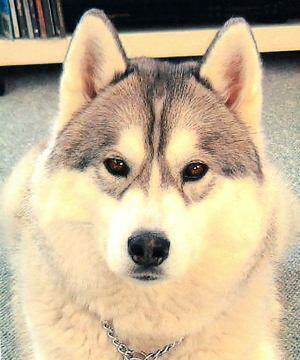 Arluk was a loving, loyal and gentle Siberian Husky. He enjoyed a wonderful canine life and was commonly known as VP of SILA. He traveled at the age of one to the high Arctic from the condominium life of Toronto. His rescue from the concrete city was his break in life and he loved his new home in Iqaluit Nunavut with our company president Robbin. He went everywhere with her, to the office, to stores, for long walks on the tundra and he grew to love her deeply. Arluk’s life was all about Robbin and for Robbin, Arluk was her most trusted companion. It was in Iqaluit where he officially became her hero. Arluk (Inuktitut for Killer Whale) literally dragged Robbin home in a blinding white out blizzard after a winter storm blew in unexpectedly and his instincts told him his “R” had lost her direction on the tundra. He tugged, pulled and towed her to their doorstep even though his eyes were nearly frozen shut. Arluk was a master at masking pain and he would always put on a brave face at home and even more in public despite many medical ailments. However, in January 2012, he unfortunately could no longer find the energy to enjoy even the simplest moments of a happy dog’s life. Robbin and Jim also know Arluk will miss his “K9 Greeter” position at K9 Country Cottage kennels in Sidney BC as he brought extensive job experience with him from Iqaluit, Nunavut where he would welcome visitors at this northern airport with deafening howls, just like his sled dog friends did on the tundra. Remembering Arluk's YFB airport traditions, Robbin always claims it must have been the acoustics, but … if you ever caught that hint of magic in his deep brown eyes when he grinned saying, “I’ve still got it!” you immediately knew there was something more special about Arluk. 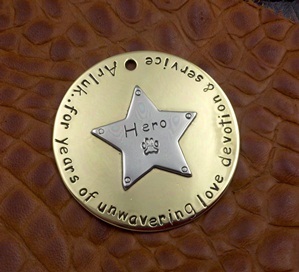 He will always remain Robbin’s hero and it is so sad that a custom-made courage medal ordered for him did not arrive in time for him to wear proudly, even if only once. We hope he sleeps soundly now and that he will again be the unwavering, devoted, loving, powerful yet gentle animal he was… in a better place. 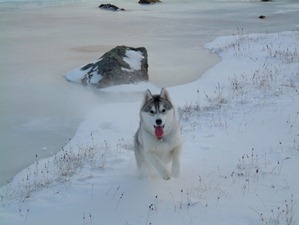 Arluk the Arctic Hero will be greatly missed at SILA, by Sakku and at our home. 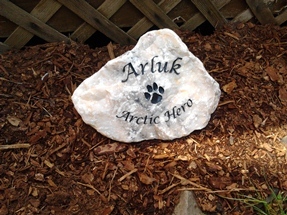 Like Arluk, his memorial stone began its journey from Ontario and now resides in B.C. Arluk's spirit lives on at his beloved Pequod Landing on Gabriola Island. His stone is prominently displayed there and welcomes family, friends and visitors upon their arrival. Sakku and our newest husky Atii aim to keep the "greeter" tradition alive. Arluk would be very proud. Arluk always believed, you should never take more than you can give. Read Arluk's full length tribute. At SILA Management Services Inc., we work closely with individuals and organizations who share a view toward creating, developing and enhancing opportunities in the north for Nunavummiut.